What Do You Mean It's Not Worth Localising Yakuza 3? Time for more Let's Fantasy! This week, we look at Sega's Yakuza 3, a game many of you would like to play, but which Sega seem intent on never releasing in the West. 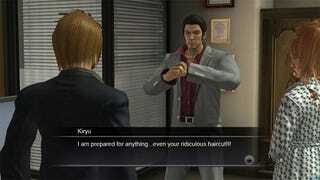 Yakuza 3 American Release Still "Unconfirmed"
Their excuse? A combination of things that basically boils down to the fact that this game won't sell many copies, and the first two games in the series in the West didn't sell many copies, which means translating the third one isn't worth the time/effort. And it's an excuse that just doesn't cut it. So the first game lost money? That's because you spent AAA money on a niche import title. So the second game bombed? That's what happens when you release a PS2 game in 2008. And this one won't sell many copies? Doesn't matter. The game's been made already; we're talking the cost of putting some subtitles in and a pinch of marketing, which (relatively speaking) for a major publisher like Sega must be little more than pocket change. This doesn't need to be localised into 7 European languages. English will do. Even if it's only released in the US, people from Canada, the UK, Ireland, Australia, New Zealand, South Africa and Singapore can import it, not to mention those elsewhere with the English skills to get by. Come on, Sega. If you could be bothered releasing the game in Korea, you can do the same for the West. It's only fair.